In a move reminiscent of our early days together, Shane and I jumped on a big, square, yellow truck in the middle of Quito with eight complete strangers. We had signed up for a ten-week overland trip with Oasis Overland, which would take us 7,000 kilometers from Quito, Ecuador to Rio de Janeiro, Brazil. Overlanding is a unique form of travelling. It involves cooking, camping and spending large amounts of time with a group of other people, which can be good or bad, depending on the people! We have taken overland trips before, and written about the pros and cons of overlanding here, but overall it is a good way to see a lot for very little money, and we were excited for a change from more traditional backpacking. 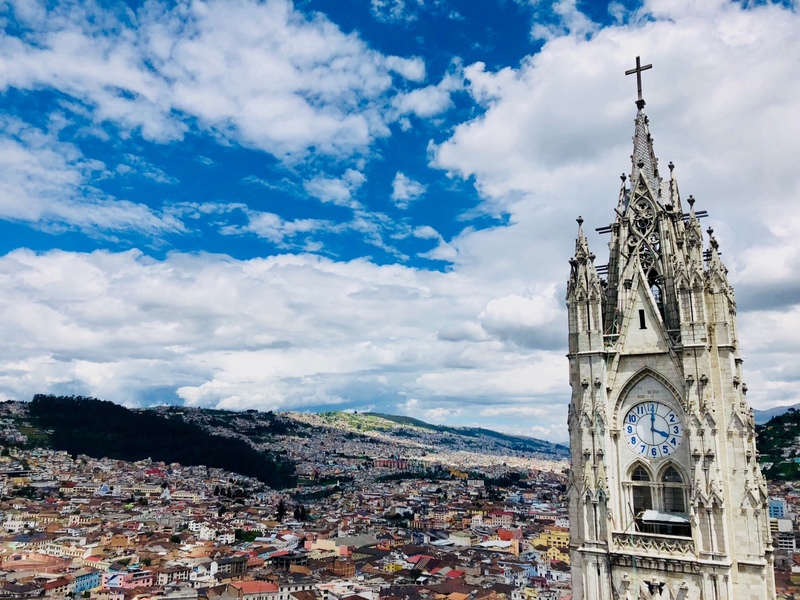 Before we joined our trip, we spent a couple of days of sightseeing in Quito. Having read numerous accounts of travellers being robbed and warnings about the high crime rate, I was feeling a little on edge. We tried to take sensible precautions – we took small amounts of cash with us (no phones and no credit cards), we didn’t walk around at night, and we read up on the various scams commonly used to separate tourists from their money. Luckily, we survived. 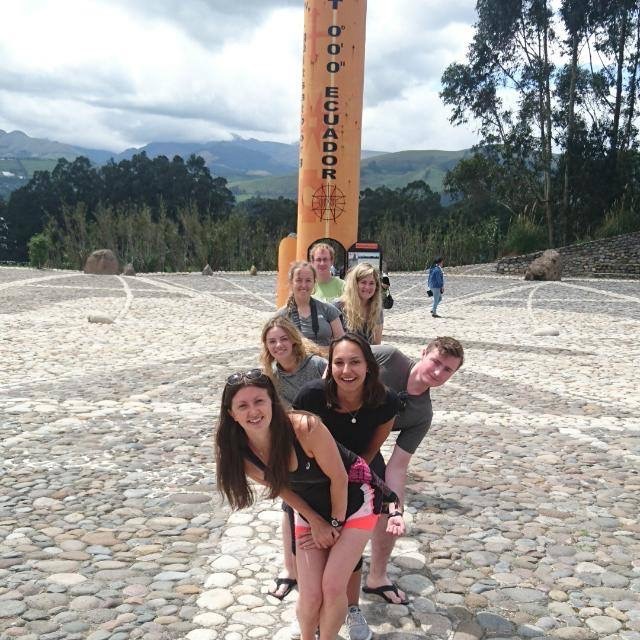 In fact, we really enjoyed our time in Quito. We took a free walking tour around the city where we met Marissa from Switzerland, who was also about to embark on the same overland truck with Oasis. 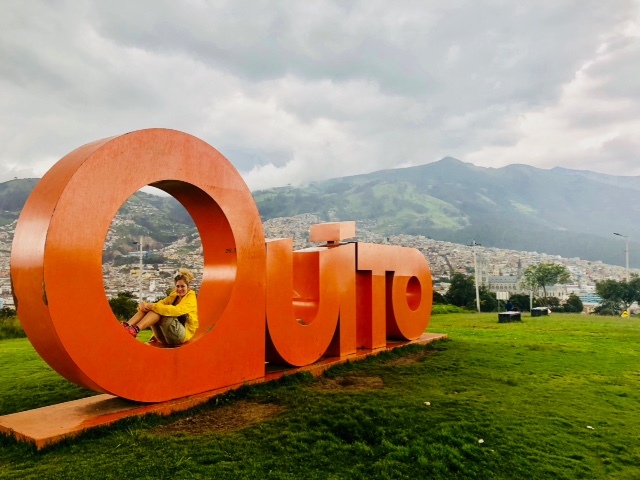 We wandered around the old city, visited various churches, tried the local food and climbed up to a viewpoint where we enjoyed a panoramic view of the city and the mountains, followed by a torrential rain shower. After a couple of days exploring Quito, we took a taxi from our hostel in the old town to a slightly ominous looking hotel in the new town, where we met our truck (named Spongebob after its yellow colour and square shape), our tour leader Gayle, and driver James. The taxi ride in itself was an adventure, as the driver took us miles in the wrong direction, while claiming he knew exactly where we were going. Shane had to salvage the situation, and thanks to our trusty app maps.me and some interesting hand signals, he managed to help get us to our destination. That night we met our fellow Oasis Overland passengers. It was a nice surprise to see Marissa again, and we also met Hattie, Holly and James (three nineteen year olds from Surrey taking some time out between school and university), Jess (a recent graduate from St Albans) and Andrea (a physiotherapist from North Wales with some time to spare between jobs). We were surprised by the lack of diversity in the group (almost everyone was under 30, and almost everyone was British), but with a small, cohesive group, we got to know each other quickly and easily. The next day we hopped aboard Spongebob (our truck) and drove for a few hours to Otavalo, a town famous for its giant, colourful market. On the way we stopped at the equator, where we learned that the map of the world is the wrong way round, and took a few photos. 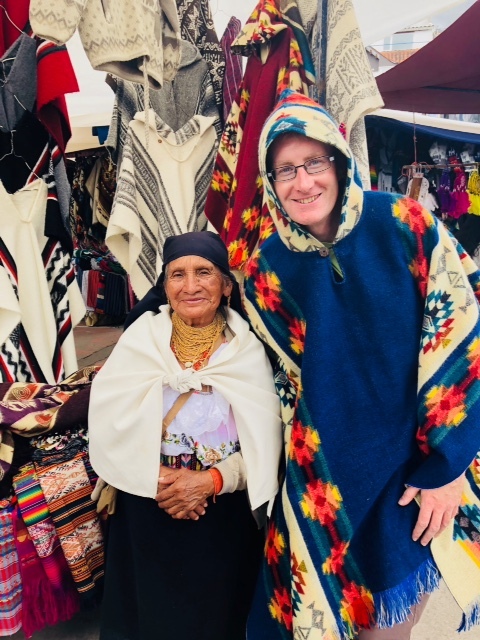 In Otavalo we quickly set about discovering the market’s many treasures, and looking for clothes that would keep us warm in the mountains in the coming weeks. I managed to snag a huge pink blanket, a jumper and a wooly hat, while Shane found a beautiful blue rainbow poncho, all made from alpaca fur, and all for bargainous prices. The next day, Shane and the “kids” (Hattie, Holly, James, Jess and Andrea) went for a walk to a nearby waterfall, while I stayed at our hostel, hoping to recover from a tummy problem I’d been suffering with since Quito. Unfortunately no amount of rest or starvation seemed to fix me, so I trundled off to the pharmacy to buy some mystery antibiotics with the hope of curing myself before we headed into the Amazon rainforest. Our accommodation in the heart of the jungle could only be reached by boat, so after a long drive, we left Spongebob at a riverbank and boarded a narrow dug-out canoe, which brought us along the river and eventually to our secluded jungle lodge. We met Tom, a cheerful American who now called the rainforest his home, and found our rooms in a wooden building, which looked a lot like a tree house. As ‘honeymooners’ (technically still true), Shane and I were given the nicest room at the top of the house, complete with its own bathroom, balcony and hammock. With no TV, no wifi and no other civilization nearby, it was lovely to relax on our balcony and listen to the sounds of the jungle all around us. The next morning we embarked on our first jungle activity; a walk through the rainforest. This started off well, as we learnt about the different flora and fauna, and worked our way deeper into the jungle. We also saw a poisonous frog hopping around on the forest floor. However, at some point I started to feel unwell. It was now five days since I’d eaten a proper meal and I was feeling weak, dizzy and sweating buckets of liquid that I couldn’t afford to lose. Shane kindly offered to take me back, and as we left the group we ended up on our own special adventure, which involved hacking our way through the forest and destroying spider webs with sticks. 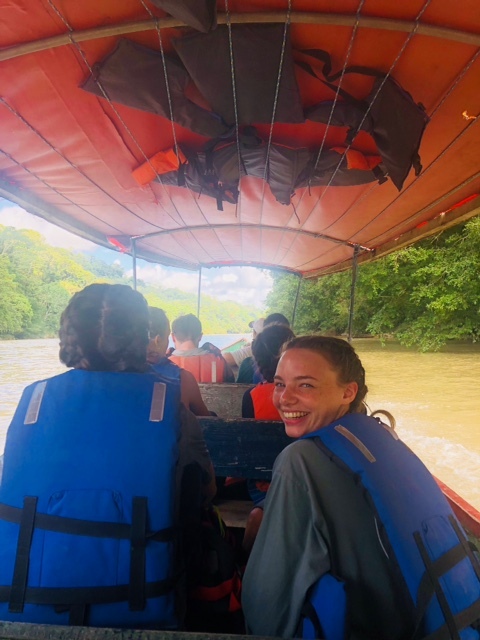 Later on, the rest of the group went back into the jungle to visit the local community and learn about an old way of life (including eating the local delicacies and witchetty grubs), while I continued to rest and recover back at the peaceful jungle lodge. By the evening, I was feeling much better, and was able to stay up while the rest of the group had a few drinks and a bit of bonding time. The next day I felt well enough to join the rest of the group on the next jungle activity: a visit to the Amazonia rehabilitation centre, where various animals who had lived difficult lives were being looked after before they could be released back into the wild. 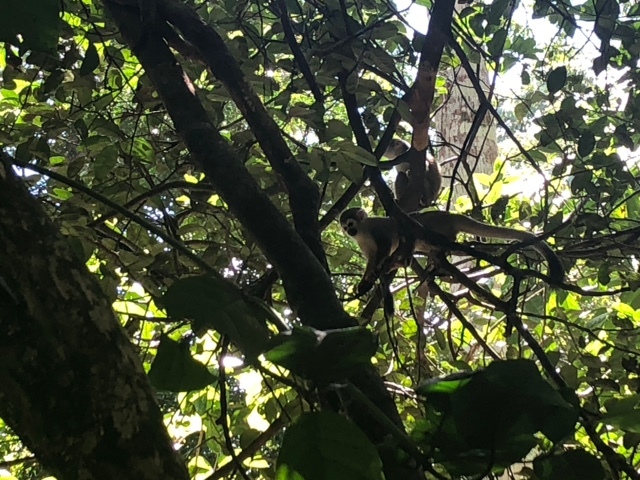 We saw lots of beautiful birds; tucans, parrots and macaws, different species of monkey, and even some big cats roaming around. 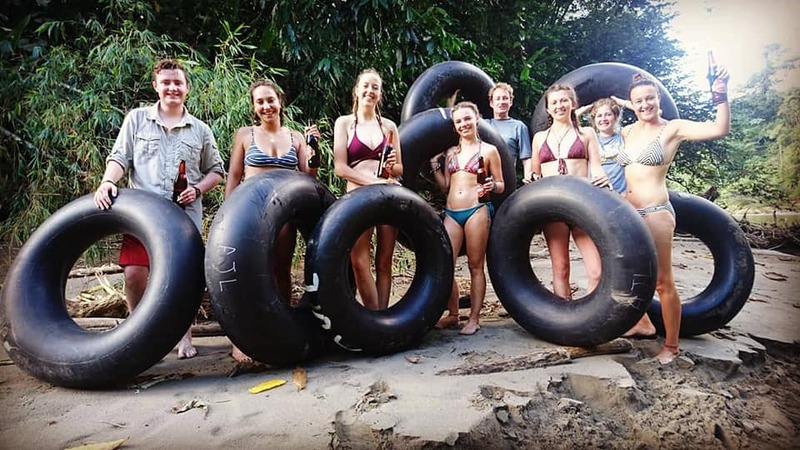 In the afternoon we went tubing down the river, which turned out to be a more relaxed affair than our most recent tubing adventures in Sumatra, and then came back to the jungle lodge for delicious food and more time to relax. 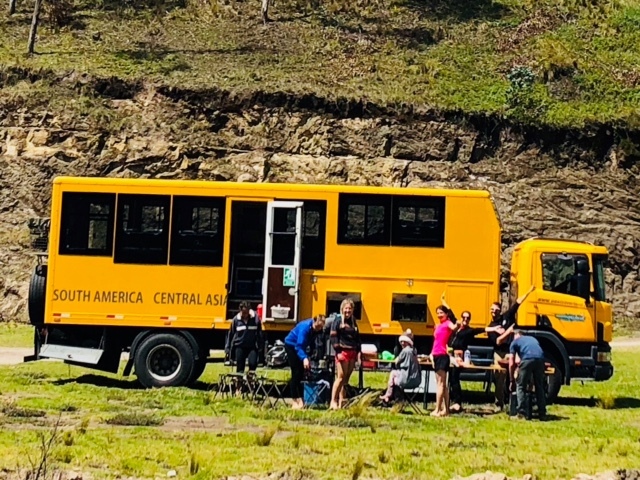 By this time, I was feeling a lot better, so by the time we reached our next stop (the town of Banos, famous for its hot springs, giant waterfalls and adventure sports), I could participate fully in the group’s activities. Banos was the first place where we had to camp and cook for ourselves. Shane and I put up our tent, and then Andrea and I were the first “group” to cook. Luckily we were staying at a campsite, so we had full use of a kitchen, and managed to make a delicious lasagne for the rest of the group. The next day we set out to tick the big Banos attractions off our list. 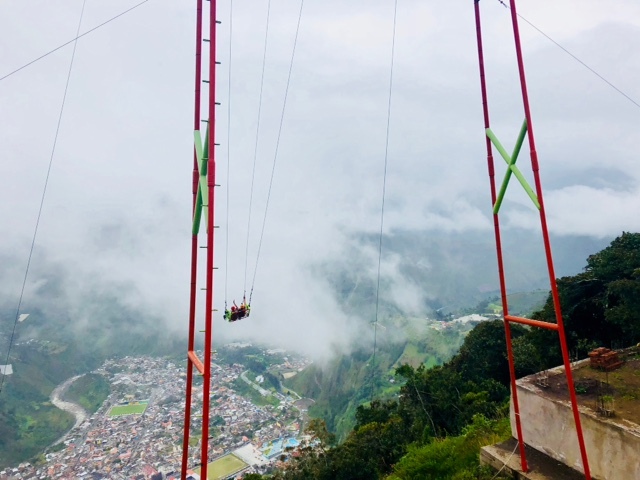 We took a bus from the campsite to the centre of Banos, and then another bus to the top of a mountain, where we could “swing off the edge of the world”. For just $1, we were allowed into a park where we could take turns on various swings and ziplines. Swinging out from the top of a mist-covered mountain, the ground disappeared from below your feet, and it really did feel like you were swinging off the edge of the world. 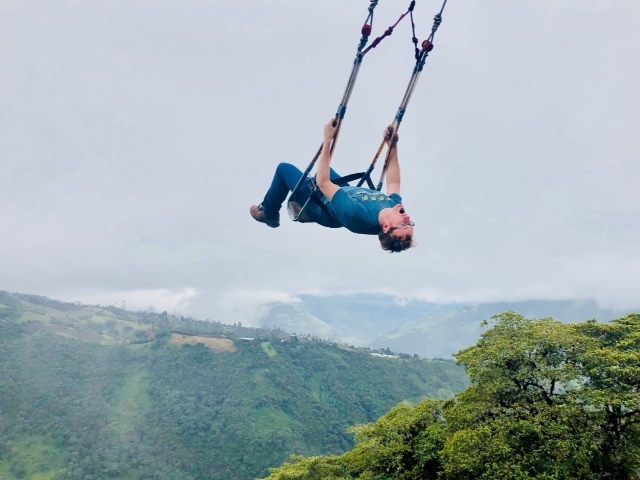 As if that wasn’t enough of an adventure for one day, we then walked along a mountain ridge to another, bigger, scarier swing, which also involved swinging off the top of the mountain. We spent the rest of our time in Banos getting absolutely soaked visiting the different (and very impressive) waterfalls, and relaxing in the hot springs which made Banos famous. 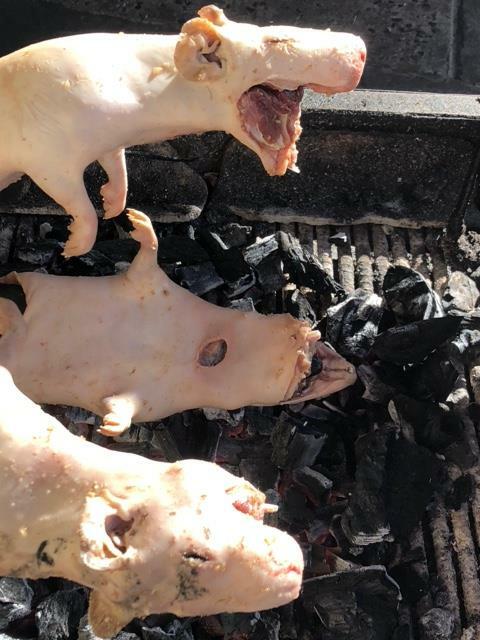 We even found time to indulge in some tasty guinea pig, a South American staple that we had all wanted to try. Thankfully it tasted better than it looked. Our final stop in Ecuador was the pretty and historic town of Cuenca. 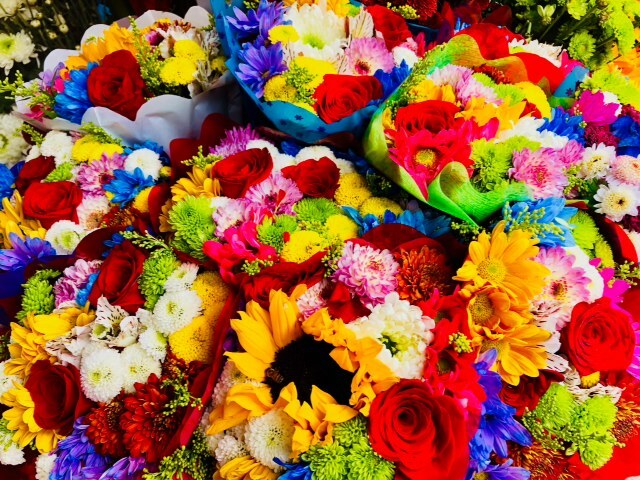 We arrived in Cuenca with little knowledge and no expectations of Ecuador’s third largest city, but were pleasantly surprised to find old, beautiful buildings, narrow, winding streets and flowers on every corner. We started our day in Cuenca with a free walking tour of the city, which allowed us to get our bearings and pick out the top sites we wanted to see. 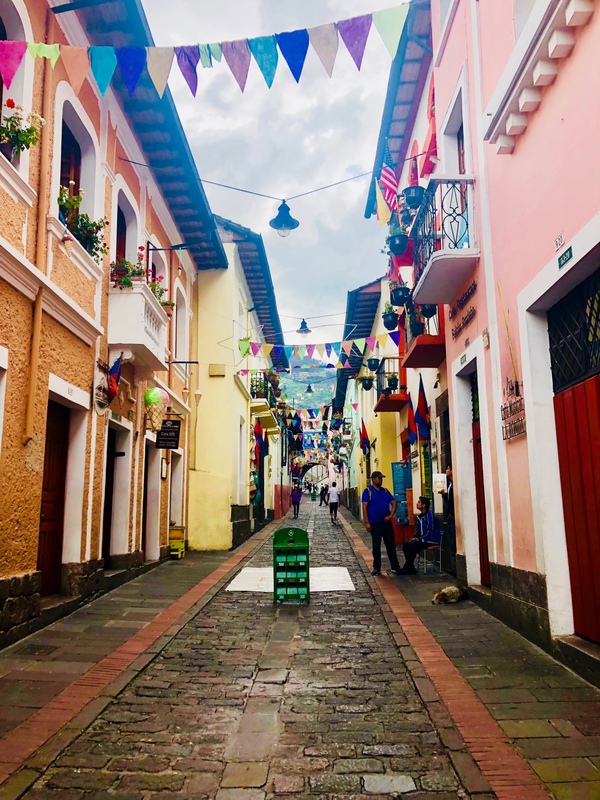 After the walking tour we headed to the market, where we ate some delicious hog roast with potatoes and rice for lunch, and bought some even more delicious Ecuadorian chocolate. 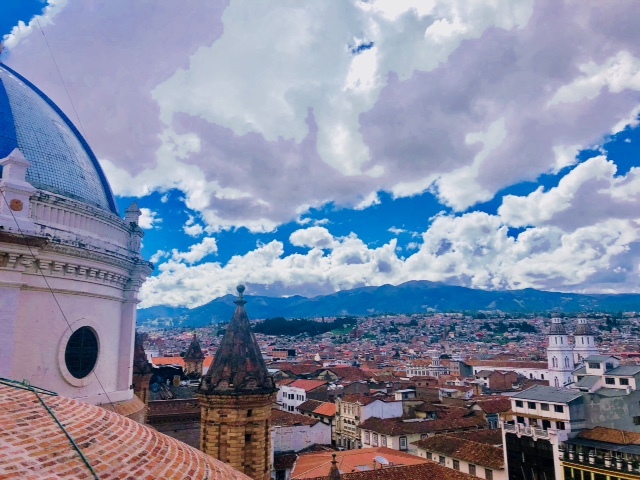 We also visited the Panama Hat museum (despite the name, Panama hats actually come from Ecuador), and the city’s cathedral, where we climbed the tower for an excellent view of the city. After three fantastic weeks in Ecuador, it was time for a change of scenery. After fighting our way across the border (we had to contend with a large group attempting to push their way to the front of the very slow queue and a broken photocopier, which delayed the truck’s entrance), we noticed some dramatic changes as we arrived in Peru. The landscape looked much drier, the people seemed much poorer, cars had been replaced by tuk-tuks, and rubbish littered the side of the road. At the same time, people waved and shouted as Spongebob thundered down the road, and beautiful beaches beckoned in the distance.